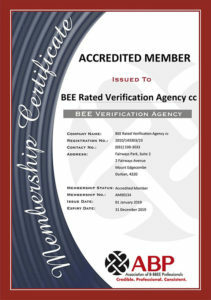 The new, amended B-BBEE Codes of Good Practice were gazetted on 11 October 2013. A transitional period of one year has been allowed, after which it becomes mandatory for all BEE verifications to be undertaken in terms of these new Codes. As you are probably aware, the amendments are far reaching and, unless properly addressed and prepared for, will have a significantly adverse effect of your BEE rating. For information, please see the attached slides from a workshop presentation we gave to our clients in November last year, which endeavours to outline, explain and clarify as far as possible, the amended Codes. Please note, at present, there is much in these amended Codes that requires clarification and interpretation, so the interpretation and understandings contained in the presentation must be taken as somewhat preliminary. Our industry body ABVA (Association of BEE Verification Agencies) is presently engaging with the Department of Trade and Industry in order to obtain such clarity. As and when we are updated, we will keep our clients informed. In the meantime, should you have any queries, kindly contact us. "A value added service, in my opinion"
"Excellent agency, will definitely use again"
"Excellent and proficient service, most affordable BEE Rating Agency"
"We are very impressed with the professional services provided by BEE Rated"
"A pleasure working with you"
"It has been a pleasure working with Kim and Nomcebo. The professionalism and efficiency was outstanding. Bee Rated come highly recommended." "Thanks for the excellent service Looking forward to doing business with you guys again in the future"
"As always your service has been great. We appreciate your promptness"
"Excellent, friendly and speedy service!" "Very happy with BEE Rated, Nomcebo was very professional and the process flowed smoothly"
"Instructions clearly set out. Tony always available to clarify points requiring further explanation. A smooth, professional rating"